Y'all are going to LOVE today's wedding. I'm looking forward to spring probably more than anyone you know (not even joking), but I absolutely loved looking back on this wedding from last September. Gabby and Chris are the sweetest couple ever, and their wedding was incredible. 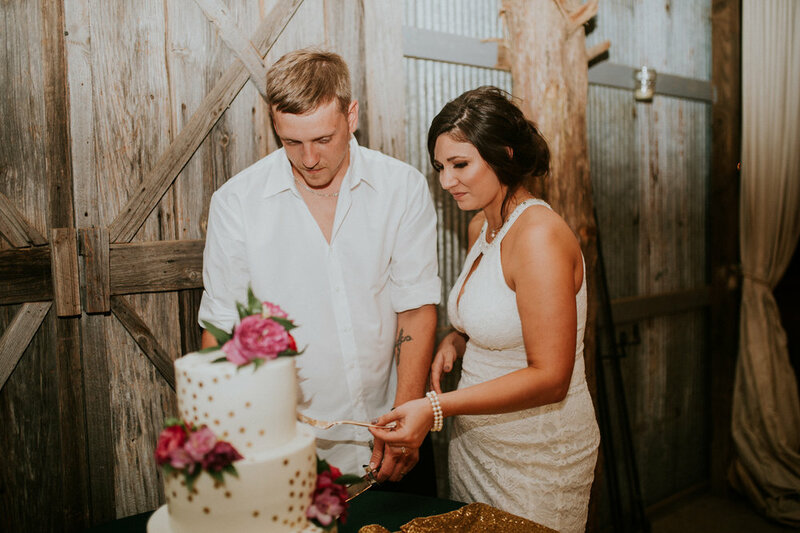 My favorite details were their unique altar, their florals (which were full of gorgeous, rich colors), their super sweet unity ceremony, their adorable polka dotted cake, the amazing gold details that were all over the place... okay, basically I'm just head-over-heels for every single detail! 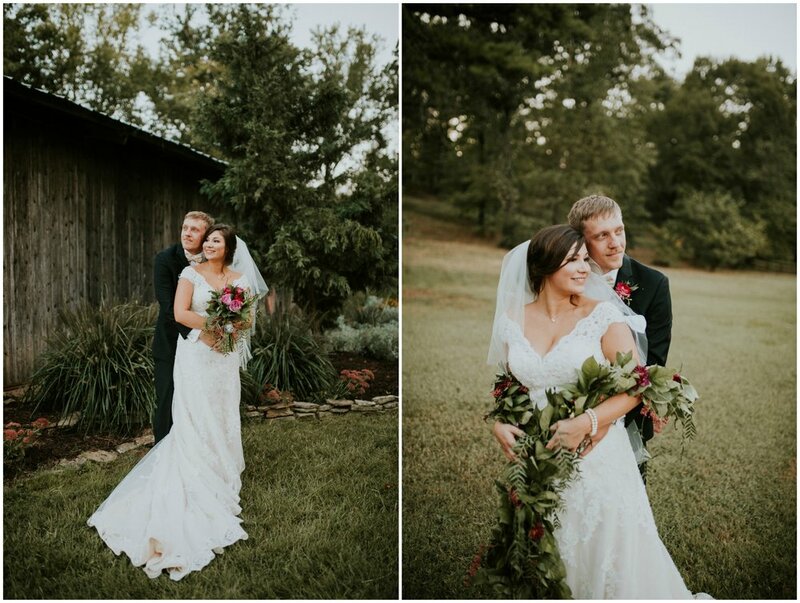 We ADORE these photos by Myranda Randle Photography. So much magic in these. Enjoy! Gabby and Chris were married at The Barn at Twin Oaks Ranch on September 23, 2017. Their wedding was full of beautiful burgundy details, the prettiest greenery, and pops of gold. It was elegant and so very beautiful. 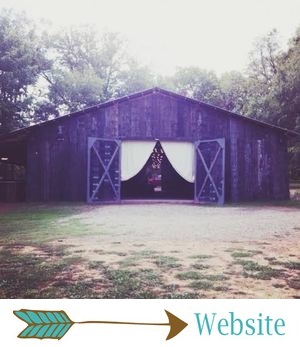 The perfect fall wedding! Gabby's bouquet and florals were seriously dreamy. They were full of deep purples, reds, and a few pops of pale pink. And TONS of gorgeous greenery. Those purple dahlias made my heart skip a beat! 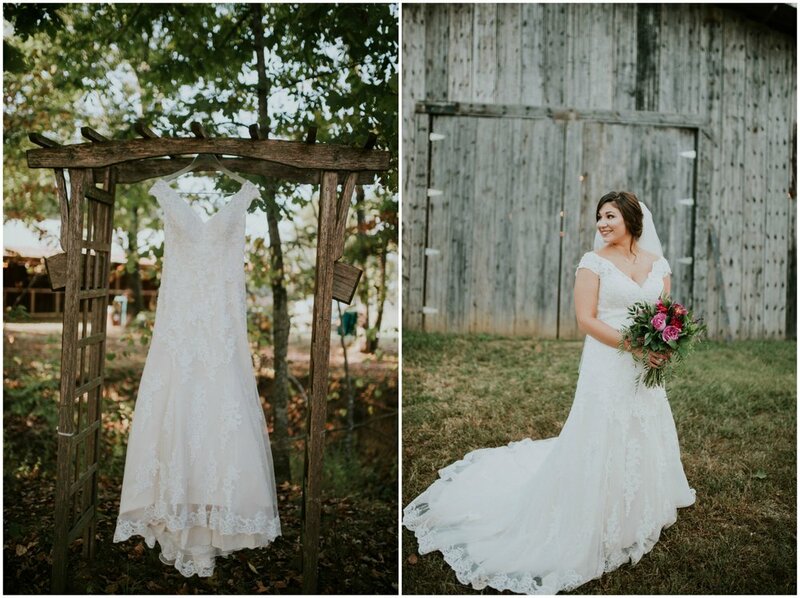 Gabby wore a beautiful, timeless bridal gown with the prettiest neckline and lace details. This dress will never go out of style! Gabby and her flower girl also wore Converses with ribbon laces... one of the cutest details of the day! Gabby's bridesmaids wore floor-length, one-shoulder dresses in a rich, gorgeous shade of purple. The guys wore classic black suits. And everybody wore Converses! Such a fun, awesome group. Gabby and Chris had a stunning ceremony. Their altar included the most gorgeous burgundy draping, as well as a greenery garland with purple and red flowers and a floral tieback. The garland down the right side of their altar was my favorite part! Lining their aisle were logs topped with gold vases full of florals, as well as lanterns and candles. Their guestbook table had a vintage typewriter, a vintage suitcase, a small floral arrangement, and a touch of glittery gold. Gabby and Chris had a perfectly sweet, romantic and intimate ceremony. They included their cute kids in their unity sand ceremony, which was such a special moment! It always melts our hearts when our couples include their sweet little ones in their ceremony! We're swooning over these portraits! Gabby and Chris, y'all are gorgeous people! Garlands are totally our new favorite prop for bride and groom photos. These photos are major eye candy! Gabby and Chris's reception was absolutely MAGICAL. Their details were gorgeous, romantic and sooo dreamy. Their tables included white tablecloths, gold glittery runners (GASP), a few wood discs, white tapers on gold candlesticks, floating candles in vases (insanely pretty), lanterns, and beautiful florals in gold vases. All of the candlelight at this reception was pure magic. This was one of the dreamiest receptions ever!